Innovation: Spurred By Introverts or Not? Reflection is an important, but forgotten capability. 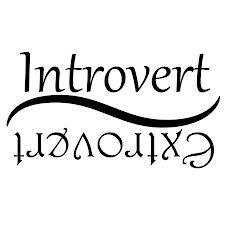 It is often said that introverts get more energy through reflection and that it dwindles during interaction. Well, we need more reflection. There is too much action in this fast paced world and when it comes to ideas and innovation, the best results seem to come when you take a break and reflect on the problems you are trying to solve. Organizational structures need to make room for introverts. With the exception of a few pockets such as R&D and accounting most functions within a company seem to be driven with an extrovert-like attitude. But not all people are social. Many are introverts and don’t necessarily want to socialize and focus on external matters. What about them? Introverts must learn to turn on the switch. Far too many meetings either take too long or should never have taken place at all. The matters could have been dealt with in more effective ways than a meeting. Introvert or not. But when I need to interact with others in the physical world, I have trained myself to turn on a switch that allows me to be a good networker (ask questions, focus on the other person) and deliver good talks. I would actually argue that introverts are capable of becoming better networkers than most other people because we are more likely to define a purpose and execute on this before we interact like this. We need to develop the softer skills. Yes, it is kind of a cliché that soft skills such as networking, communication and “people skills” are really the hard skills, but this does not change the fact that too many companies fail to educate their employees on this. More importantly; they don’t give the employees the time needed to develop these skills. Those who want to succeed in the social era need to change this. Social media works well for introverts. You can “hide” and still have a strong voice in your community or industry. This is one reason that I spent so much time with social media. It is a great way to communicate and since there is so much input (some call this information overload), it gives you plenty of opportunities to reflect on what is happening and thus build further on your own thoughts and ideas. Social media makes it easier for introverts to become more social. It is a win for everyone. Introverts can challenge the crowd. Since most introverts shy away from the crowd, they often see the crowd in a different perspective. We need all perspectives when we work with innovation and good innovation leader make an effort to recognize this and thus pay extra attention to listen to the more “quiet” introverts. Lindegaard’s comments should be challenging to traditional organizational development thought. He almost goes so far as to recommend diversity strategies to balance personality types in work groups. Furthermore, he portrays as valuable the tension between thinking and communication, solitary productivity vs group performance. Think about these concepts and your own organization. Consider how you may better organize yourselves to be more innovative.